Middle distance standouts figures to be valuable asset to cross country lineup through the ACC Championships…great range for 2014 NCAA Championships 800 qualifier and same-year ACC Outdoor champion at that distance. Cross Country: Competed in a career-best six meets, including the ACC, South Region and NCAA Championships…was team’s No. 5 scorer at the ACC Championships where the Noles finished fifth…ran 32:02.0 at South Region in first shot at 10k distance…best finish came at FSU Invitational, where he was ninth. Indoor: Finished third in the 800 at the ACC Championships, and also contributed a leg to fourth-place DMR…indoor career-best 800 came at David Hemery Valentine Invitational (1:49.09) where he was fourth…also lent a 1200-meter leg to the No. 2 DMR performance (9:39.50) in program history at the same meet…competed in four meets. Outdoor: Came up short in his bid to return to NCAA Championships despite a near-PB 1:48.74 at the East Preliminary…contributed a third-place finish in the 800 as the Seminoles won the ACC Championship on their home track…ran lifetime-best 1:48.57 at Florida Relays…opened his outdoor season with a lifetime-best 3:46.99 in runner-up 1500 finish at FSU Relays. Cross Country: Used his cross country season with the Seminoles as a building block for the indoor and outdoor seasons while competing sparingly unattached…competed in his first 8k at the FSU Invitational where he finished in 27:45.88. Indoor: Competed in four meets, primarily focusing on the 800…posted his fastest time at the Tyson Invitational, placing sixth in 1:50.52…contributed a sixth-place finish at the ACC Championships, where the Noles brought home the team title…was also the alternate on the NCAA Championship 4×400 relay. Outdoor: Enjoyed his finest season as a collegian, advancing to the NCAA Championships in the 800, where he earned second-team All-American honors with the 13th-fastest preliminary round time…also contributed a leg on the qualifying 4×400 relay team…ran 1:49.24 to qualify ninth for the championships at the East Preliminary…posted a then PB of 1:48.74 for runner-up finish at Jace LaCoste Invitational…won the ACC title in the 800 with a perfect move off the final curve after posting the fastest preliminary round time (1:49.46)…scored his first win of the season at the Seminole Invitational. Signed with USF out of high school and sat out the 2012 cross country season as a redshirt. Indoor: Lined up in five meets for in 2013, including the Big East Indoor Championships, where he posted his collegiate-best indoor 800 (1:53.42) in the preliminary round and was member of sixth-place 4×400 relay (3:15.10). Outdoor: Competed in seven meets for USF as a true freshman, including Big East Outdoor Championships…posted season-best in 800m (1:51.57) at Seminole Invitational with third-place finish…also set PR in 1500m (3:53.93) at FSU Relays…opened outdoor season with wins in 800, 1500 and 4×400 at USF Open. 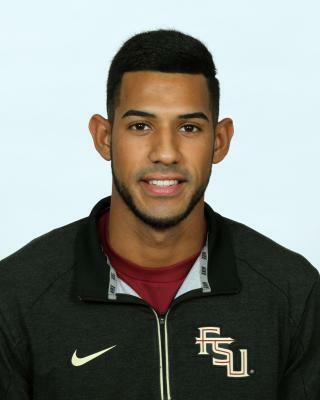 Aspires to represent Brazil a the 2016 Olympic Games in Rio…considers Miami as his hometown but starred in Lake Brantley High School in Central Florida…capped prep career winning 4A state title in 800 with a PR (1:51.43)…also won 800 at FSU Relays and was second in 1600 with PR of 4:14.78…was also a state cross country qualifier where his fastest 5k time was 15:57…state 4A runner-up in 800 as junior…competed in the 2013 USA Junior Outdoor Championships this past summer in both at 800 and 1500…majoring in international affairs…born Jan. 15, 1994.